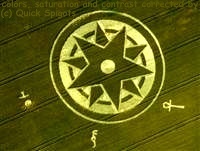 Crop circles - Timelapse recording - chronology. Explanation, decipher, decode, discovery, break code, explaining, decryption, puzzle out, scientific research. All Crop Circles surveyors quite mistakenly believe, that after finding appearence of patterns and discovering that they have lost the most important phase (its creation). Then it is possible only to document it and there is nothing more to do. But this is not absolutely true, because a lot of very interesting things will just happen next days (apart from - the crowds of curious onlookers, rushing the field). It is not possible to record the entire process from start, but that what will follow, is not less interesting, vice versa. The progress may be traced until harvest, sometimes also a little later. One of the other major mistakes Crop Circles explorers made, their assumption that the formation of crop circles anywhere in the world is a matter of minutes, estimated at around 5-10, 20-30 at most, and even before nor after in the field already nothing happens. In fact, the whole storyline, which happens on that place, occupies cumulatively 1000 - 1500 times longer time. Several months. lodging (damaging, weakening) of the crop (that primary, most observable), during which it truly and completely naturally occurs, is usually only a few percent of the entire period, but also well below one percent. Sometimes there may occur flattening (damaging, weakening) of crop really already during (immediately after) the lightning discharge, but they are really a very exceptional cases. Probably especially when there already happened entirely different discharge into the same crop field several weeks before (Two discharges in one place). But even if a unique extremely strong discharge happened, everything may be processed in an another way, and no "predecessor" needed. Although it may not really be noticeable, completely undamaged healthy crop can withstand even the most extreme weather conditions (wind), and immediate aftermath of the blast wave, which corresponds to the explosion of several hundred kilograms of TNT near the fields surface over the field in a split second overdo at several hundred km / hour. The blast wavw considerably Crop may momentarily bend without breaking almost to the ground, the stalks immediately after remission immediately put back into the upright position. 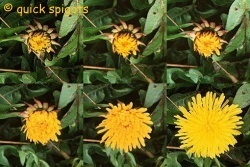 The plants have but of course such an extraordinarily intense mechanical impulse "remembered" in their tissues there may occur deform and damage (directional) parts of tissues, some cells, although initially completely unobservable, microscopic, but that during extended period of time begins to grow to macroscopic dimensions. is apparent on the plants until a relatively accurate marginal distance from the impact of the discharge, rather precisely in a circle, farther away beyond that distance almost not at all This distance can be relatively accurately determined by the intensity of the discharge. That is tens to hundreds of thousands of amperes, in extreme cases may be close to a million. Discharge occurred between points spaced on an average of 2 km. Starting tension between the cloud and the ground could be several billion volts, the current was carried out for a few millionths of a second (the most energetic part), and during the discharge happened, path between heaven and earth (there are things between heaven and earth) were radiated several megawatt hours of electricity. Described is an average or slightly above average lightning In the case of extremely strong discharge may be in progress a value more thousand times greater. Irradiated electric energy over the last few meters to tens meters of the discharge above the field was partially induced into the plants (in a relatively exact circle from the point of impact) and damaged them. This damage, however, was immediately after the discharge completely visually unobservable, and several hours after no effect on plants, reduction of mechanical strength, flexibility, tensile strength, resistance to fracture and break. But after a few days let alone weeks, microscopic changes begin to grow noticeable even macroscopically, and changes will be on plants visually and mechanically observable. 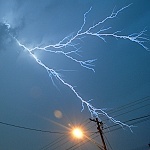 Farmers might be able to count theirrselves lucky that the vast majority of energy is radiated in the discharge path between heaven and earth surface, the lightning channel whose width is around 5 mm, and even in the most extreme lightning discharge does not exceed 10 mm (sources differ, exist also information 10 to 20 mm, explained elsewhere). This channel plasma with a temperature of approximately 30000 degrees C at the moment when the lightning current passes through it, acts as a resistor of approximately 1 ohm per meter. It is a rough approximation, but for now this explanation is enough. If the value of the channel resistance was much lower, say ten times, almost every energy of the discharge would be radiated just after the touching of the discharge (Return Stroke) forehead to the ground, and farmers would be in such places on a considerable area of such field instead of crops harvesting a charcoal. In addition to the induced energy may be some energy conducted into the plants also through the soil, as an equivalent of the so-called stepping voltage. Thanks to that may be affected mainly some parts of plants root systems, depending on the variability of electrical soil resistivity and underground layers, once again often relatively accurately in a circle. Another factor that may conduct an electric current into the plants at some distance from the discharge forehead point of impact, is the corona (corona discharge). It surrounds Return Stroke as a cover up to a certain distance, like a conductor is surrounded by an insulation (sheath - Corona Sheath, see Search Engines). Diameter of corona depends only on the discharge current (peak), the higher the peak current, the farther extends. 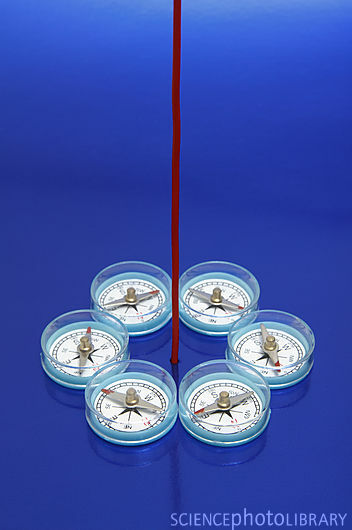 Makes contact of electric current with plants very accurately to the distance radius of the corona, of course, in a circle. Is there located between P.T. 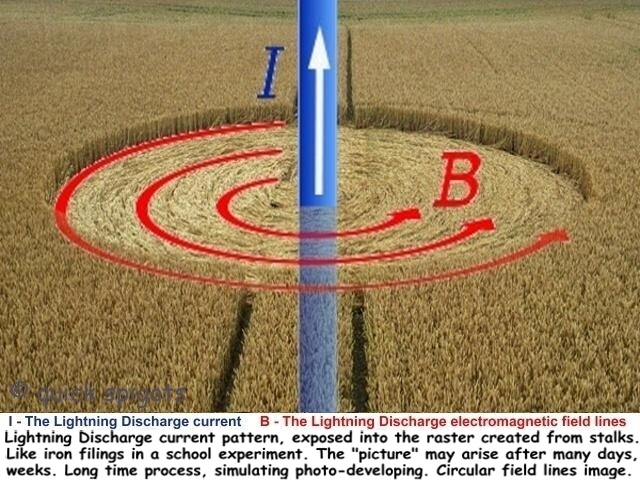 audience any more "sceptic" who does not believe that the lightning discharges are able to create in the field a circle of damaged plants, that sooner or later die, or only bend to the ground clockwise or counterclockwise? With pronounced ideas is possible not agree, also possible protest against them, but it maybe really all that is possible to do with it or against it. So called Jerry Cimrman's postulate. C.Chaplin: A day without laughter is a day wasted.